DAVIS, California, September 3, 2010 (ENS) – A woman in Tacoma, Washington who apparently died of poison on April 1 may have been killed by hemlock after gathering the leafy green weed and using it on a salad. Her death was no isolated incident, say weed experts. Each year dozens of Americans die or are sickened by weeds they did not know were harmful. There are many toxic weed species, and the Weed Science Society of America has assembled a list of 10 that are especially dangerous. Click here to see images of all these poisonous weeds. The list is topped by two very dangerous genera of hemlock. 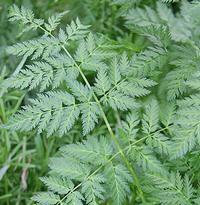 Poison hemlock (Conium maculatum) is a biennial weed with fern-like leaves that can be easily mistaken for parsley. Like parsley, it is in the carrot family. The plant produces a number of toxic substances, but the most deadly is the alkaloid coniine – a neurotoxin that disrupts the central nervous system. Ingesting even the smallest amount can result in rapid respiratory collapse and death. One way to identify poison hemlock is by the purple-red blotches on its stems. This is the species responsible for the death of the Greek philosopher Socrates. Waterhemlocks (Cicuta douglasii and Cicuta maculata) are also native perennials in the carrot family. They grow in wetlands and marshes and are easily mistaken for a variety of edible plants, including young carrots, wild celery, watercress, wild ginseng and particularly parsnips. Like poison hemlock, water hemlock is highly toxic. It produces a substance called cicutoxin that stimulates the central nervous system and can trigger violent seizures. Oleander (Nerium oleander) is a woody shrub often planted in suburban landscapes and along roadsides. 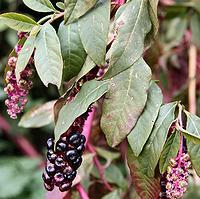 It is extremely toxic and produces a poisonous substance that can cause heart arrhythmia and cardiac arrest. DiTomaso cautions that you should never burn oleander branches – the fumes can be hazardous. He has even heard reports of severe illness when an oleander stick was used to roast a hotdog over an open fire. Bittersweet nightshade (Solanum dulcamara) is an invasive weed related to both tomato and potato plants. It can be extremely toxic, and in fact, the juice from wilted leaves is deadly. The most common type of nightshade poisoning comes from eating its green berries, which turn red to purple in color as they mature. Pennyroyal (Mentha pulegium) is an invasive species in meadows or wet areas. It is known as an insect-repelling herb and is sometimes used as a tea. It is even found in some health food stores as an herbal medicine. But DiTomaso cautions that the weedy version of this plant is trouble if too strong a tea is made from the leaves. It can cause liver damage, lung damage and death. Both weed scientists and physicians say pennyroyal should be avoided. It’s not worth the risk. Meadow deathcamas (Zygadenus venenosus) and other deathcamas species are native perennials in the lily family. They tend to grow in forested or meadowy regions. All parts of the plant are toxic. That includes its bulb, which is easily confused with edible wild onions. One differentiator between the two is that deathcamas lacks the distinctive odor typical of an onion. Foxglove (Digitalis purpurea) is an escaped ornamental plant that produces tall stems ringed with colorful bell-shaped flowers. The soft leaves at its base are easily mistaken for comfrey or sage, but lack the distinctive smell of the safer species. But looks can be deceiving. This invasive weed is very poisonous. DiTomaso says it produces a chemical that can speed up and strengthen heart contractions. The leaves on the upper stem are particularly potent; just a nibble is enough to be deadly. Groundcherry (Physalis spp.) is in the tomato and potato family. Its leaves and unripe fruit are poisonous if ingested and can even be fatal. But the ripened fruit loses its toxicity and is sometimes made into jellies, jams and sauces. The ripened fruit of one species, tomatillo, is a very common ingredient of Mexican salsas. DiTomaso says it is not unusual for the toxins in a weed’s fruit to break down with ripening. In fact, it’s another survival mechanism. If a bird, deer or other predator eats the fleshy fruit, the seeds inside are spread and the plants multiply. Jimsonweed (Datura stramonium) is also in the tomato and potato family. It produces a dangerous poison that can be fatal to humans and animals, including livestock and pets. 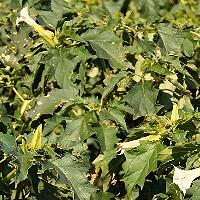 Jimsonweed produces seeds that are highly hallucinogenic and can trigger bizarre and violent behavior. “Lots of weeds are edible, but there are many dangerous exceptions,” DiTomaso warned.